– Goa for the Arts, The International Centre Goa and Art Chamber are delighted to serve their love for the arts. Personally passionate about the arts, Dattaraj and Dipti Salgaocar sought to create a platform in Goa to encourage, learn, understand, appreciate and promote the visual arts through education, dialogue and collaboration. 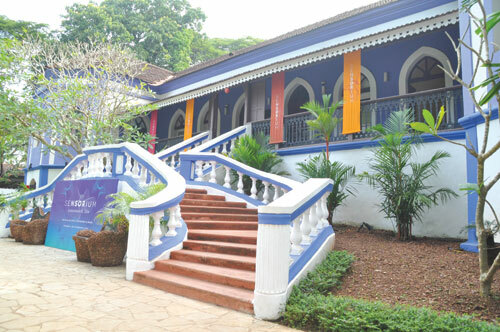 “Sunaparanta – Goa Centre for the Arts is a dream come true. It is my private non-profit initiative. It is to bring art to Goa and Goans to art,” avers Dattaraj Salgaocar, Chairman of the Centre. Remaining firm to this commitment since it commenced five years ago, the Centre has achieved much, making it a vibrant hub for the arts through a series of innovative cultural programmes. “I am very happy with what we have achieved in this short span. We have always believed in giving creativity a free hand and encouraging new initiatives. We hosted the prison art programme, initiated by Margaret and Swati Nair, in our second year, which was unique and appreciated worldwide. We also believe in collaboration and partnerships to bring the best to Goa and have collaborated with the Gulbenkian Foundation and Anil Dharker of Lit live! A recent addition to our programmes are the salons by renowned writer and artist Siddharth Shanghvi – a conversation series that has quietly established itself as a top ticket must-do event for artists and writers of repute. We have hosted many firsts in Goa including the first-ever Sunaparanta Mario Miranda Cartoon Festival / Workshop. Our annual shows held in December broaden the conversation on art in India,” explains Salgaocar. If the ongoing Sensorium Festival is a success, it’s thanks, in a large measure, to its executive producer, Isheta Salgaocar. Invited on board by her parents to direct programmes at the centre, this Stanford Graduate with a Master’s Degree in Journalism from Columbia is tapping on her vast experience working with major global figures to infuse a fresh and diverse outlook for Sunaparanta. A forum to bring thought leaders together for the purpose of research and sharing of knowledge and ideas with society at a local, national and international level, The International Centre Goa (ICG) has been conducting a series of lectures, talks and workshops ever since it commenced 15 years ago. “The main aim and purpose of ICG is ideational and although promoting art and culture is also an objective, it is secondary to the ideational objective,” affirms ICG President, Yatin Kakodkar. Over the years, ICG has ensured this through a series of interactive talks, lectures, seminars and workshops, book readings and art exhibitions with artistes in the national and international arena. However, the advent of the Goa Arts and Literary Festival (GALF) in 2010 raised the bar for these activities. Similarly, the collaborative efforts with Toastmaster’s International and Sunday Evening Quiz Club added momentum to its endeavour to make the Centre a pro-active one. Despite teething problems, GALF’s success today can be attributed to many factors. “The most important improvement was GALF connecting with Goa without losing its national and international outlook. One way they achieved this was by involving Konkani and Marathi writers and poets from Goa. More importantly, GALF attracted a serious-minded audience who had an interest in literature and arts. GALF 2014 has been a great success because the organisers exhorted students to participate. Around 1,079 students took part in the festival,” avers Kakodkar who promises that ICG will become an even more happening and interactive place in the future by empowering Team ICG. Started with the objective of creating a gallery for local artists in 1997, at a time when there were none in Goa, the Art Chamber has today evolved into an eclectic ‘art hub’ for artists from around the world. “The objective was to encourage art happenings and also provide an opportunity for locals to view art,” explains co-owner Yolanda Souza Kammermeier, who, through her website and visits to various art camps around the world, has invited several artists to showcase their works in Goa. To create awareness and encourage young talent in art, Yolanda also initially conducted art classes and school competitions. “Art was not taken seriously initially nor were locals interested in it, but over the years, the trend has changed,” avers this artist who played a large role in creating the right interest in art. The Friday Night Art Bazaar and Dr Pedro Cabral Adao Promising Artist Award are two recent initiatives in this direction. To double the art quotient, Rudolph Kammermeier, a pianist and composer, has continually invited some world class pianists, musicians and dancers, both Indian and Western, to perform at the gallery. “The monthly Classical Music Series that commenced in 2011 provides people with a great opportunity to see some of these world renowned artistes perform,” he maintains.